Set on the banks of the River Usk, the market town of Abergavenny has strong links to the Battle. Local nobleman William ap Thomas fought alongside Henry V at Agincourt and was knighted in 1426 by Henry VI, becoming known as ‘The Blue Knight of Gwent’ due to the colour of his armour. The Steward of the Lordship of Abergavenny, William lived at Raglan Castle and was responsible for many of the defensive improvements that can still be seen there today. William’s second wife Gwladys – known as ‘The Star of Abergavenny’ on account of her beauty – had Agincourt connections of her own. Legend states that her father Sir Dafydd Gam and first husband Sir Roger Vaughan, who both perished defending the King, were knighted as they lay dying. 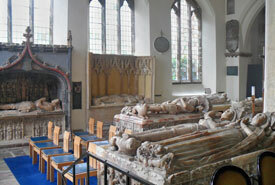 William and Gwladys are buried at St Mary’s Priory in Abergavenny, founded by Benedictine monks in 1087. St Mary’s is no ordinary church. The couple’s tomb is just one of its many important historic monuments. It’s known as the ‘Westminster Abbey of South Wales’, famous for its exceptional medieval sculptures, reckoned to be the finest of any parish church in Britain. Modern Abergavenny is a bustling town known for its many markets and annual Food Festival, held every September. History buffs should also pay a visit to Abergavenny Museum, located in the grounds of the town’s ruined Norman castle. It’s a fascinating insight into centuries of local history, with exhibits that include Roman artefacts, a recreated World War II air raid shelter and a 19th-century Welsh kitchen. Check the Events page to find out more about how Abergavenny is marking the 600th anniversary of the battle of Agincourt, and visit www.abergavenny.org.uk for more information on the town.